Bronchogenic cyst. 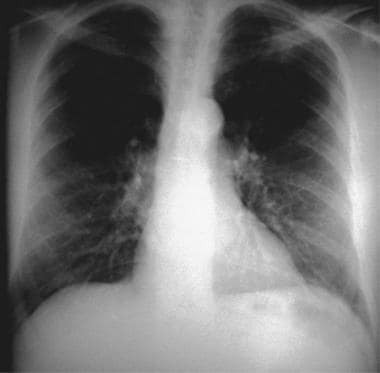 Anteroposterior view on conventional radiograph demonstrates a mass in the aorto-pulmonary window. Bronchogenic cyst. Anteroposterior CT demonstrates a mass with fluid density. Bronchogenic cyst. Axial T2-weighted MRI demonstrates a high signal mass in the right paratracheal region. 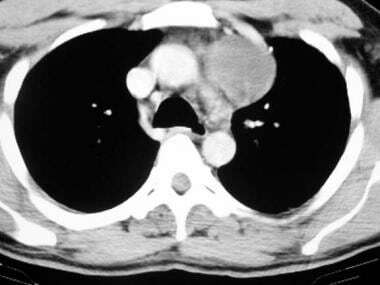 Mediastinal cysts are visualized as a mediastinal mass on conventional radiographs. Intrapulmonary cysts usually present as a solitary pulmonary nodule unless the cyst contains air. Radiographs of bronchogenic cysts are depicted in the images below. Bronchogenic cyst. 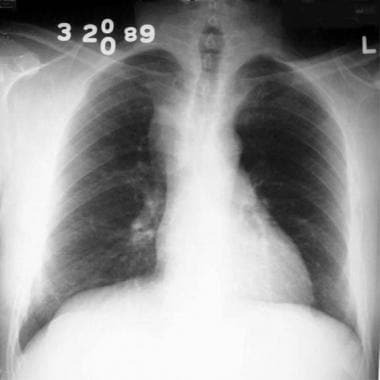 Lateral view on conventional radiograph demonstrates filling of the retrosternal clear space correlating to the abnormality observed on the frontal view. Bronchogenic cyst. 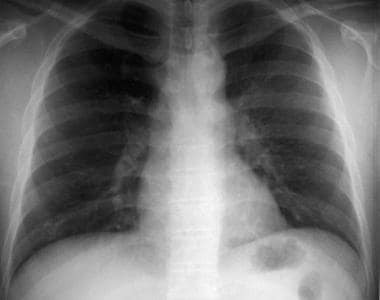 Conventional radiograph demonstrates a right paratracheal mass. Bronchogenic cyst. 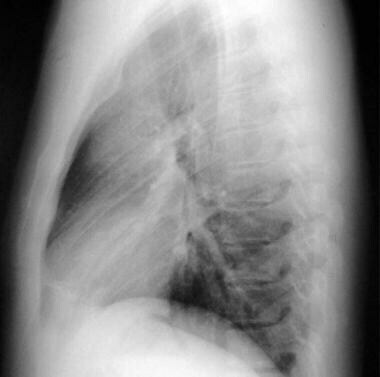 Conventional radiograph demonstrates a subcarinal mass. Bronchogenic cyst. 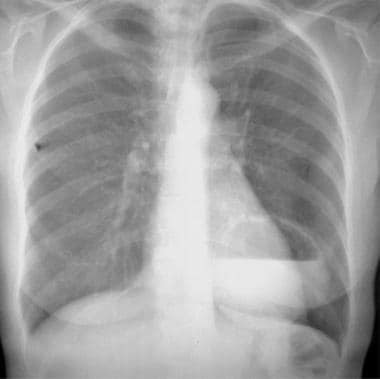 Conventional radiograph demonstrates a thin-walled cyst in the left lower lobe with an air-fluid level. On conventional radiographs, findings are nonspecific. Mediastinal masses should be evaluated further using CT scanning or MRI to confirm the presence of fluid. Difficulty is encountered in determining whether the visualized mass is benign (eg, a bronchogenic cyst) or malignant. In addition to intrapulmonary and mediastinal locations, bronchogenic cysts have been reported to be located in infradiaphragmatic areas, cutaneous areas, intrapericardial areas, and intramural areas of the esophagus. CT scans of bronchogenic cysts are depicted in the images below. Bronchogenic cyst. CT demonstrates a subcarinal mass with fluid density. Bronchogenic cyst. 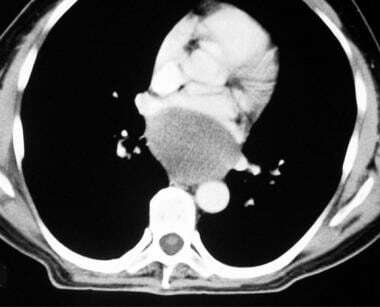 CT demonstrates a thin-walled cyst in the right upper lobe. In the proper clinical setting, a CT scan finding of a sharply marginated, nonenhancing, water-density mass is diagnostic of a bronchogenic cyst. Nonenhancing masses demonstrating soft-tissue density need further evaluation using MRI. Location is also important. Intrapulmonary cysts are usually difficult to diagnose and usually require aspiration for diagnosis. 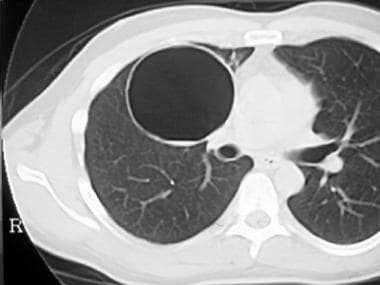 Most bronchogenic cysts are relatively characteristic in appearance on CT scan, but in atypical cases with hemorrhage or infection, findings may be confused with those of necrotic adenopathy, cystic lung disease, or lung abscess. On T2-weighted images, the brighter the cyst, the more confident the diagnosis of bronchogenic cyst. Lack of enhancement is also characteristic. Location is important in differentiating bronchogenic cysts from other cysts, such as pericardial cysts. 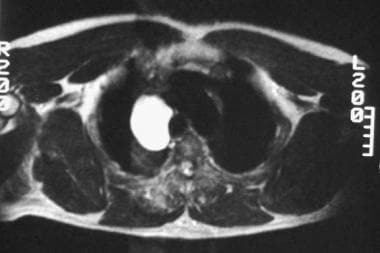 As with CT scans of typical bronchogenic cysts, MRI findings are very specific and few false-positive or false-negative findings occur. For atypical cysts, the main confusion is with necrotic tumors or infections. Kumar AN. Perinatal management of common neonatal thoracic lesions. Indian J Pediatr. 2008 Sep. 75(9):931-7. [Medline]. Shah SK, Stayer SE, Hicks MJ, Brandt ML. Suprasternal bronchogenic cyst. J Pediatr Surg. 2008 Nov. 43(11):2115-7. [Medline]. Lima M, Gargano T, Ruggeri G, Manuele R, Gentili A, Pilu G, et al. [Clinical spectrum and management of congenital pulmonary cystic lesions]. Pediatr Med Chir. 2008 Mar-Apr. 30(2):79-88. [Medline]. Cardinale L, Ardissone F, Cataldi A, Gned D, Prato A, Solitro F, et al. 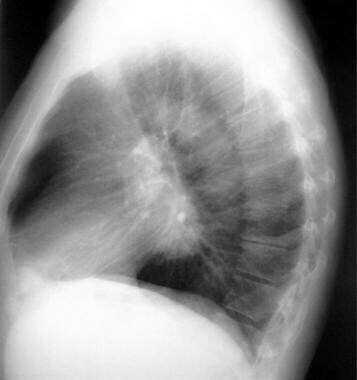 Bronchogenic cysts in the adult: diagnostic criteria derived from the correct use of standard radiography and computed tomography. Radiol Med. 2008 Apr. 113(3):385-94. [Medline]. Ko SF, Hsieh MJ, Lin JW, Huang CC, Li CC, Cheung YC, et al. Bronchogenic cyst of the esophagus: clinical and imaging features of seven cases. Clin Imaging. 2006 Sep-Oct. 30(5):309-14. [Medline]. Gorkem SB, Coskun A, Yikilmaz A, Zurakowski D, Mulkern RV, Lee EY. Evaluation of pediatric thoracic disorders: comparison of unenhanced fast-imaging-sequence 1.5-T MRI and contrast-enhanced MDCT. AJR Am J Roentgenol. 2013 Jun. 200(6):1352-7. [Medline]. Recio Rodríguez M, Martínez de Vega V, Cano Alonso R, Carrascoso Arranz J, Martínez Ten P, Pérez Pedregosa J. MR imaging of thoracic abnormalities in the fetus. Radiographics. 2012 Nov-Dec. 32(7):E305-21. [Medline]. Wang Y, Dai W, Sun Y, Chu X, Yang B, Zhao M. Congenital bronchial atresia: diagnosis and treatment. Int J Med Sci. 2012. 9(3):207-12. [Medline]. [Full Text]. Jeon HG, Park JH, Park HM, Kwon WJ, Cha HJ, Lee YJ, et al. Non-infected and Infected Bronchogenic Cyst: The Correlation of Image Findings with Cyst Content. Tuberc Respir Dis (Seoul). 2014 Feb. 76 (2):88-92. [Medline]. Katsenos S, Rojas-Solano J, Becker HD. Endobronchial ultrasound: a useful tool in the diagnosis of bronchogenic cyst. J Clin Imaging Sci. 2013. 3:57. [Medline]. Naidich DP, Muller NL, Zerhouni EA. Mediastinal cysts. In: Computed Tomography and Magnetic Resonance of the Thorax. 3rd ed. Philadelphia, Pa: Lippincott-Raven. 1999:125-7. McAdams HP, Kirejczyk WM, Rosado-de-Christenson ML, et al. Bronchogenic cyst: imaging features with clinical and histopathologic correlation. Radiology. 2000 Nov. 217(2):441-6. [Medline]. [Full Text].